Originally formed at art school in Brighton as a conceptual performance piece, Dream Wife have rapidly established themselves as one of the most exciting bands in the UK. 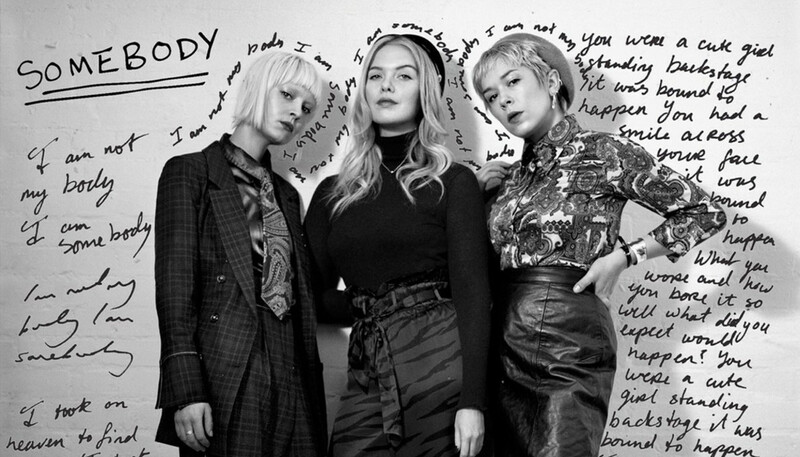 We gave band members Bella Podpadec and Alice Go a call to discuss #MeToo, safe spaces and the ferocious pop-punk on their long-anticipated, eponymous debut album. Having been hotly tipped in 2016, it feels like you kept a slightly lower profile in 2017. What were you up to last year? Bella Podpadec: We’ve been really getting our album ready, and focusing on getting the band on the road to places that maybe haven’t heard us before. It was our first summer doing festivals last year and that was so exciting. But I think we’ve just been really hard at work. Alice Go: Yeah, I think having a year where we knew weren’t going to be releasing the album – that was going to be coming this year – it felt like it might be quite a slow, quiet year in a lot of ways. But I feel like we’ve really been honing what we do, learning how we want the songs to be live. It’s been this year of preparation for the album coming out. 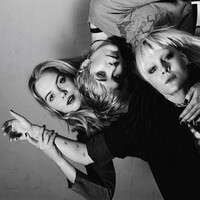 BP: And playing shows with bands that we really, really admire – like The Kills and Sleigh Bells – we’ve been seeing how they perform and what the craft of a stage show is for them and responding to that. Just making things bigger. AG: I think we’ve been earning our chops a bit. Dream Wife was a concept before it was a band, is that right? AG: Yeah. But from the start of the project, even when it was a performance art piece, I think as much as it was highly conceptual I remember it being a very organic process of understanding [the project] through playing shows, even when we had four songs. It was this thing of just doing it, and seeing what happened and making our decisions from that. So I think it started as an idea, I suppose, and it’s really snowballed from there. We’ve all overcome a lot to be able to do what we do in Dream Wife, in terms of personal battles. Were you setting out to explore particular ideas? BP: We found out so much about what it is we’re doing, what it is that we want to say and what it is that we want to explore through doing interviews and being asked about the things that we’ve done, and then working out what our motives are through that. AG: It’s been an ongoing conversation. BP: And quite a fluid, adaptable process as well. In a lot of senses, our values really lie in forming solidarity in the community of creative people around us, so we stand by the same values and we can fight for that together and have fun while we’re doing it. Can you remember what your first impressions were of each other? BP: I just thought Alice was the coolest person I’d ever seen. AG: I mean, me and Bella have known each other for a long time. We grew up in Somerset and I saw her band play at a battle of the bands. I remember thinking, “Who is this little freak? This is someone like me, I need to know who this person is.” I think we just saw something in each other. But we met Rakel in Brighton. You lived with her, didn’t you? BP: Yeah, yeah. We both moved in with people that we didn’t know and all became friends. Tell us about the kind of music you bonded over? AG: We’ve all got a real love of classic rock. AG: 70s and 80s rock and pop. But I think in the more modern stuff we all have different tastes. Rakel is more in touch with mainstream pop music than either me or Bella, and I’m really into French house. We all differ and come together in so many ways and it’s about that unity and the differences together, I suppose. Dream Wife feels like a multidisciplinary project, rather than just a band. How are involved are you in the aesthetic and visuals? AG: We’re very involved but also we like to collaborate. I think understanding what our limitations are and what we can get from a relationship with someone else is important. There are a number of people that we’ve worked with for a number of videos. BP: People like Meg Lavender – who came on tour with us and is documenting the “bad b*tches” at our shows. There are ongoing creative conversations with people that we really trust as artists and really love as people. AG: Yeah, I think we all have a very analytical mindset or the ability to do that, which might come from our Fine Art background perhaps. But I think it’s nice to open that creative world to trusted others around you, and let people in because it can be all the stronger and greater for it. Your debut album is even more ferocious than we’d hoped it would be. What can fans expect from the record? BP: (Laughs) That’s good to hear! For us, the live show is so important and I think when we were writing these songs we had to understand them live before we could record them because live is the true form for our music. Ultimately, these are pop songs but they have to translate the live energy, and it was a challenge to really get that energy across because in the live show the energy is coming from the crowd; it’s like a conversation with everyone there. So we had maybe three takes to get the track down, and I think we spent a year fine-tuning what the record is. It was really good to hear you say ferocious, because it was about getting a raw power down, but it still has a pop sensibility. We’re really happy with it. This album is a real milestone for us in terms of where we’re at sonically, and where we’re at in terms of our message. BP: I think each song has a different message but the overarching message is us wanting to empower women. So the track ‘Somebody’ is about raising awareness of the issues currently facing women or female-identifying people. AG: Pursuing Dream Wife, all of us have gone through times where we’ve been confronted by the limitations of being assigned a female gender, or living in that space. And it’s about realising that that stuff isn’t real – because so much of it is imposed on you – and it’s about wanting to be able to share that realisation with other people as well. I think we’ve all overcome a lot to be able to do what we do in Dream Wife, in terms of personal battles. Do you find fans sharing their experiences with you? AG: Yeah. In October we toured the UK and it was just around the time of the #MeToo campaign, and it felt like a really powerful moment. We did girls to the front, and hearing girls standing together, holding hands, singing, “I’m not my body, I’m somebody,” felt absolutely powerful. And then there’s a moment of poignancy later in the set when we’re playing ‘F.U.U’ and all these girls are suddenly on stage with us and we’re all screaming, “B*tches!” together. It’s the fact we can have this conversation but we can also have a riot while we’re doing it, and I think it’s exciting. We’ve spoken to younger girls and women about their experiences and they want to have a conversation. It feels special and empowering. BP: And we worked with this organisation called ‘Girls Against’ for a couple of shows, who promote awareness of sexual assault at gigs. It’s amazing to see people so young taking action. I wouldn’t have felt empowered to be able to do that when I was a teenager – I just dealt with groping at gigs. AG: As a girl, it’s important to have to a space you can go to with your friends and have fun and not feel threatened. BP: Our first all-female moshpit was at PINS’ album launch a couple of years ago. It was just so much fun, and it felt like a really one-off experience at the time, but on our most recent tour that happened every single night. It was just the coolest thing. AG: A Dream Wife show is a really empowering environment, actually. Everyone feels safe and like they can have fun. Finally, where would you like to be this time in 12 months with Dream Wife? AG: Oh, I hope we have another album in the works. I hope we’ve got some fresh tracks that encapsulate what the last year has been somehow. I hope that people continue to feel like there’s something for them in Dream Wife and it can help them get through whatever. BP: I hope the conversation continues with everything we’re doing right now.